Regarded for his energetic, innovative, and solutions driven leadership, Brandon Brice is a fighter for urban policy. Brandon attributes his commitment to service to his parents who instilled in him the importance of a quality education, hard work, dedication and service to others first. Brandon has stayed true to these virtues by earning a Bachelor's in Business Administration in Business Management from Howard University and a Masters of Science in Global Affairs from Rutgers University. Brandon is a recipient of the Henry J. Raimondo Fellowship through the New Jersey Eagleton Institute of Politics, and has worked as a fellow for the Heritage Foundation in Washington, DC, and interned on Capitol Hill in the Office of former United States Speaker of the House, the Honorable J. Dennis Hastert and the United Nations. Brandon began his career as an Associate with National Urban League’s Economic Opportunity Institute, fighting for the rights of families. Due to his determination and concern for fiscal responsibility and government reform, Brandon working on several campaigns, including the 2004 Bush-Cheney presidential campaign. 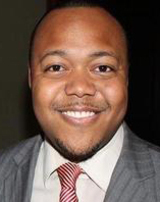 In less than two years Brandon was selected to serve as the Director of Education and African American Affairs for New Jersey Governor Chris J. Christie. Brice is a former Political Columnist with the Washington Times-Communities Digital News, Time Out New York and New York-1 News. Brandon recently served as Director of Strategic Partnerships and Development for Veterans Empowerment of Georgia and currently serves as an executive with the Boy Scouts of America and Non-Profit Consultant. Brandon has been featured as a guest political contributor on MSNBC, FOX News, Hannity, ABC, BET, New York-1, Ebony.com, The Village Voice, Time Out New York, Sirius Radio XM, the Washington Post, the Washington Times and Blaze TV with Andrew Wilkow. Brandon has given lectures at the Center for American Progress in Washington, D.C., Baruch College in New York City, Princeton University, the Harbor League of Baltimore, the National Black Law Students Association and the Alexander Hamilton Society in Washington, D.C.